Scott Adams, the creator of "Dilbert," has recently gained a bit of notoriety for claiming that there is a method behind all the Donald Trump madness. Trump, Adams insists, will probably win the Presidential election "in a landslide" because The Donald is a "master persuader." As bewildering and counter-intuitive as this assertion may seem at first blush, Adam's claims are, at least in part, based on a scientific understanding of human nature. That doesn't mean, of course, that Adams is right about Trump. He may be guilty of reading into Trump what isn't there. 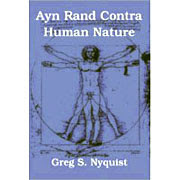 But Adams' view of human nature, nonetheless, remains largely sound. And for this reason, it might be illustrative to view Ayn Rand through the lens of Adam's own views on human nature and persuasion.